The second issue of House of Whispers is, on the one hand, fairly low key. There are no dramatic developments along the lines of the first issue, in which Maitresse Erzluie’s house was thrust so violently into the Dreaming. But that’s fine. Instead of rushing in to further events, Hopkinson and Stanton spend this issue exploring the ramifications of the House of Whispers changing locales. This affects the gods who call the house their home, as well as the human worshippers still on Earth. And, of course, the New Orleans sisters who played an important role in the first issue. I love the notion that the gods are deprived of the sustenance they receive from worship while in the Dreaming. 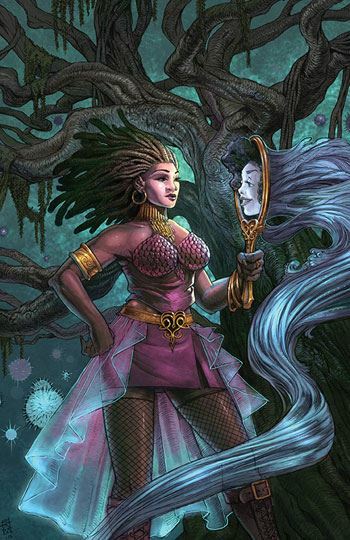 I don’t think that such a notion was ever developed by Gaiman in Sandman, but the gods were only brief visitors to the Dreaming in that book, not abruptly a resident like Erzulie. They are weakening, and Cain and Abel are doing what they can to help. Back on Earth, the changing status of the House of Whispers has had some major detrimental affects on those who were worshippers of Erzulie, and even though these are not significant characters, it’s great to see the larger effects spreading. I am still not certain exactly how this book is going to develop, but the second issue gives me assurance that the events to come will be well thought out, and well developed.